After reading and testing and eating lots of Kenji’s: Best Crispy Roast Potatoes Ever Recipe, I wanted to try and get a similar result without the use of oil. The use of oil is almost a staple in every facet of cooking, but more and more information is coming out about lowering your intake of oils. We took the science of the baking soda and par-bake of potatoes from Kenji and added our Super Steel to take care of the rest. What we got in result, was a crispy oil free potato, well seasoned and cooked potato that barely made it to the dinner table. Whats great is that you can get something crispy without coating it in oil or frying it. You can still enjoy a crispy exterior without the consumption of oil. The size/shape of the potato cut isn’t crucial at all. This cooking technique can be applied to any dish, not just crispy potatoes. We loved it at a large steak fry style wedge, but had great success at hash brown style for breakfast as well. If you haven’t yet, you may want to think about parking your Baking Steel in your oven full time. It’s going to help blast energy into almost everything your cooking. In the case with these crispy potatoes, we pre-heated our oven at 500 F with the Baking Steel on the top rack (see picture below) The heat from the Steel is going to blast straight through the baking sheet to help create incredibly crispy potato wedges. Bring a gallon of water with all of the baking soda and 3 of the 4 Tbsp of salt to a boil. Preheat oven with Baking Steel on middle rack at 500 degrees for 20-25 minutes. Add potatoes to boiling water and stir quickly to make sure they aren’t sticking to each other. Boil for 7-8 minutes, depending on size of potatoes. Remove from water and discard water. Take potatoes in a large mixing bowl and toss with seasoning. 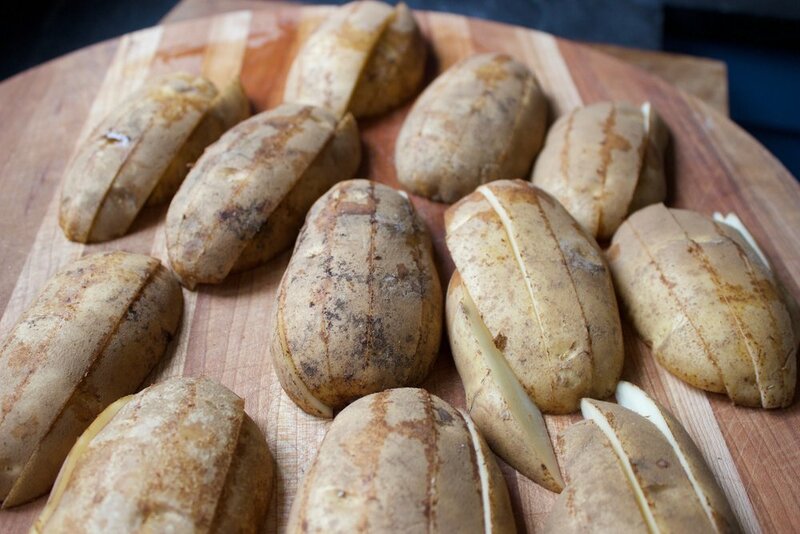 You will notice some mushy potato goodness coming off/ slicing to exterior of potatoes now. (THIS IS A GOOD THING). That is where the crispy factor comes into play. Scrape the potatoes and all the extra goodies on a parchment paper lined cookie tray and place in over for 10-12 minutes or until golden brown and crispy. Remove and toss with any extra seasoning or herbs or anything else you like. Serve with ketchup, bbq sauce, aioli, etc.